After advising VK5PAS, Paul early last night, by text, that the weather was warm, humid and dry, it rained heavily later in the evening. It started raining as we arrived at our accommodation and it became heavier and heavier and the wind increased. I had told VK6MB, Mike, that I would activate South Bruny National Park on 20 metres in the morning. I sent him an email saying I would renege and I told him the reason why. But I did say that I would activate the Park in the afternoon. You can read more to find out what happened. My last visit to Bruny Island was in 1960. A mate and I spent a weekend in August at the Island. My memories are not strong, but I do remember the isolation and gravel roads, the lack of places to buy food and the wait for the ferry. 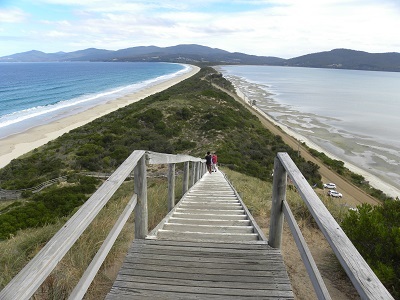 Bruny Island is desirable for IOTA chasers and is registered as OC-233 and the VKFF number is VK456. There is just one National Park and it is in three sections: a small section at Adventure Bay and two sections at the southern end of the Island. I activated the section which also is the location of the Lighthouse at Cape Bruny. 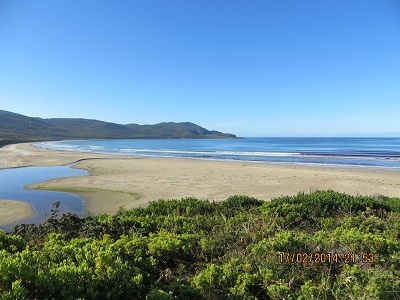 I chose Jetty Beach at the day visiting centre and campground looking out over Great Taylors Bay. This area is called Labillardiere Peninsula. 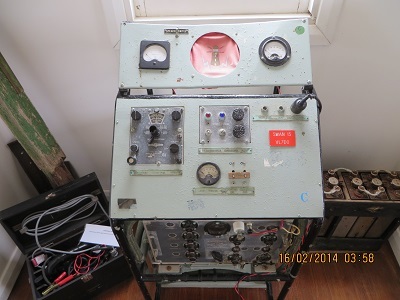 The transceiver is in the museum next to the lighthouse keepers’ residences (which are now available for hire). The call sign was VL7DO and the transceiver is on loan to the museum. It looks in pretty poor condition. The transceiver was last used on Swan Island, a small island just off the North East corner of Tasmania. The Cape Bruny lighthouse is also redundant. It was replaced by a solar powered light located about 400 metres away. The following notes are from the Parks and Wildlife Service. ‘Following a series of mishaps and shipwrecks south of Bruny Island, including the catastrophic wreck of the convict ship, George 111, in 1835 the (Colonial) Governor George Arthur agreed to erect a lighthouse to guide ships past Bruny Island. 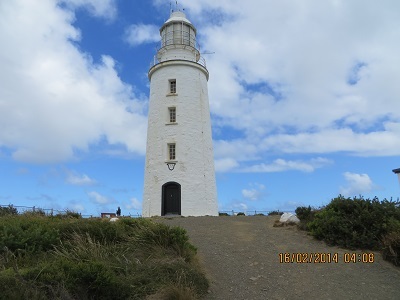 When first lit in March 1838, Cape Bruny was Tasmania’s third lighthouse and Australia’s fourth. …Technological advances in the 1980’s and 1990’s permanently altered the operation of Australia’s lighthouses. When Cape Bruny was lit for the last time on 6 August 1996 and replaced by a solar powered light nearby one of Australia’s last remaining staffed light towers was decommissioned. Along with most other Tasmanian light stations Cape Bruny was transferred from the Commonwealth Government to the State Government (on) 1 May 1998. In December 2000 it was added to the South Bruny National Park.’ The map copies we used did not show the transfer of land back to the State. And now back to amateur radio. I tried 20 metres at 04:44. The band was quiet. I called on 14.140 MHz. I decided I would try 40 metres and at 04:56, after checking the frequency, called on 7.100. I was immediately answered by VK3MNZ, Don; then followed: VK3MRG, Marshall; VK3AFW, Ron; VK3PF, Peter; VK5CZ, Ian trying out a new antenna: VK5PAS, Paul; VK3FQSO, Amanda; VK5PAS, Paul advising me that the Mount Gambier crew would call me; VK3XD, John; VK5FCDL, Col; VK3MCX, Max; VK3HJ, Luke; VK3VCE, Dave; VK5HCF, Col; VK5KC, David; VK5CZ, Ian, now slightly stronger and VK5EE, Tom. VK5PAS, Paul advised me the VK6MB, Mike was waiting for me to move to 20 metres. I indicated I would QSY to 14.140 MHz + / – I called on 14.145 MHz and was answered by VK5PAS, Paul. His signal was 5 and 9 and so was mine. Then followed VK6MB, Mike. Signals were 5 and 8 each way. Once again I was delighted to get Mike in the log. More followed: VK5WG, Nev; VK5CZ, Ian; Bruce, ZL1BWG with whom I had a 12 minute qso; VK5NIG, Nigel and finally, VK5KC, David. A total of 24 contacts in just under an hour and three quarters made for a fun afternoon. Thanks to all of those who gave me a call and now have Bruny Island and the National Park in their logs. On 17th February I activated the Park for a second time. We drove to Cloudy Bay Beach and I found a spot away from the car park and joined the 7073 morning net from South Australia. Only four contacts were had, but at 21:29, the band appeared in good condition. Brian, VK5BC/P5 at Corney Point answered my CQ. He was 5 and 7 and he gave me a 5 and 5. Then followed VK5ZK, Garry and then VK5ADL, David. It was a pity there were only four of us on the net with such good conditions. My final contact was with VK5IS, Ian, at 22:03 on 7.110. Cloudy Bay Beach is a magnificent, wide and sandy beach and we went for a one hour walk bird spotting. There were the usual assortment of sea birds: Silver Gulls, Pacific Gulls, with possibly juveniles present, Forest Ravens and plenty of Masked Lapwings. Of course Forest Ravens are not sea birds, but they were on rocks in the sea. We tried to work out what attracted them: possibly small birds or scaring sea birds into giving up their catch! There were a few Sooty Albatrosses, but the highlight for Jenny was seeing some Hooded Plovers. 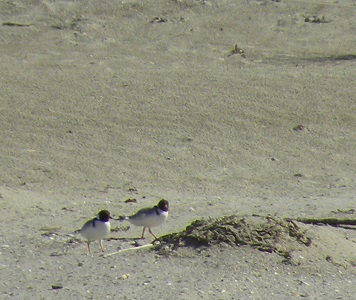 These small birds nest and camp in bits of sea weed on the sand: but they are hard to see when they are still. We have been involved in counting them, as a measure of conservation, on beaches south of Corney Point on the Yorke Peninsula in SA. At Cloudy Bay Beach a section of the beach was roped off to keep vehicles out of the area frequented by the Hooded Plover. If that roped area wasn’t present, they would simply be run over!